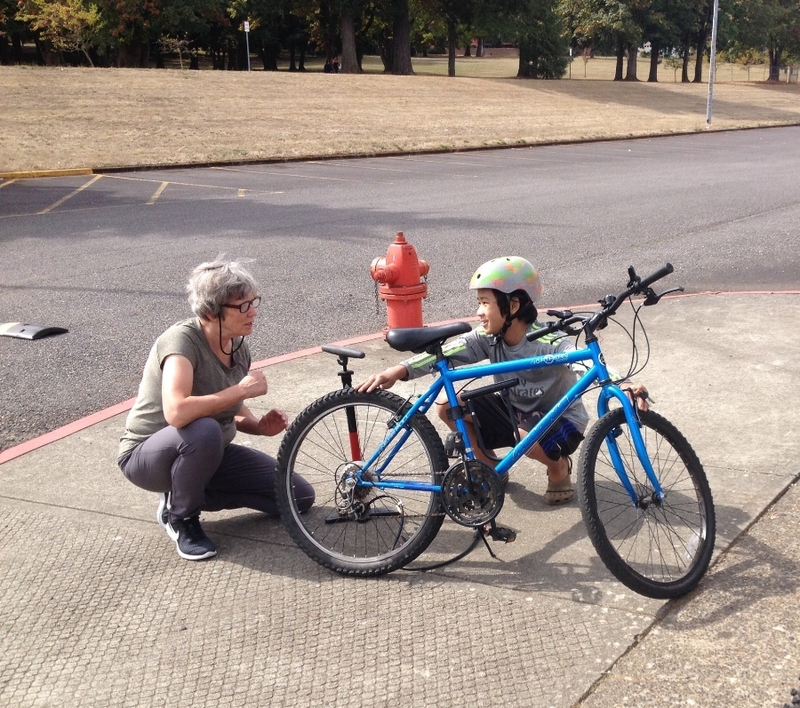 Portland Community College, the Portland Bureau of Transportation (PBOT), and Bikes for Humanity PDX are teaming up to bring you this exciting opportunity to learn how to ride a bike or improve upon your current bike riding skills! On Saturday, April 13th at PCC’s Southeast Campus located on 82nd and Division, join us for free from 10 AM to 12 PM to gain new skills and practice old ones. Bikes will be provided and are also available for sale at Bikes for Humanity PDX so you’ll have the chance to test-ride a bike you might want to adopt. Spread the word and we can’t wait to see you there! Image is a yellow poster with PCC, Bikes For Humanity PDX and PBOT’s logos in the upper right-hand corner. The text on the poser reads: Free adult riding lessons, Saturday, 4/13, 10 AM to 12 PM. Never learned how to ride or feel rusty? This class is for you! Open to all, bikes and helmets will be provided. PCC SE (82nd and Division, Quad near Mt. Tabor Hall. This is a question I have to ask myself a lot working here. As someone who considers myself still a veritable outsider to the bike community in Portland, and as someone with a larger personal mission in the work I do beyond transportation justice, I am constantly asking myself what role bikes play in the social, political, environmental, and economic landscapes I live in. What needs does a bike meet? Who are bikes for? Why are bikes an icon of transportation and environmental justice? What does it mean to be a bike nonprofit? Who is our nonprofit serving? How are we being of service? Image is of B4HPDX volunteers helping to fix bikes at the 3rd Winter Fix-It-Fair. Picture is courtesy of Fix-It-Fair organizer Lauren from Repair PDX. I remember having some conversations with our Program Director Andrew about our mission statement. When I was first introduced to B4H, I remember it being something along the lines of, “Everyone Deserves a Bike.” Not a very concrete thing to build an organization around. There wasn’t much explanation as to why everyone deserves a bike, or how bikes are meeting any primary human right such as access to food, clean running water, safe housing, or medical care. It wasn’t until Andrew started talking about transportation justice and referred me to the work of advocates like Dr. Adonia Lugo [https://microcosmpublishing.com/catalog/artist/adonia_lugo_phd], that it finally clicked. In a society where having a home, food, clean running water, education, and health-care are seen as privileges, getting to these resources becomes a barrier in and of itself. Generally, one has to have a source of income to afford these things, so getting to work becomes a necessity. For those who have barriers to employment (such as not having a car, which is required for many occupations) or who are underemployed/underpaid, then getting to resources such as a food-pantry, shelter, sleeping-spot, or free clinic becomes another serious concern. For some reason, despite having had times in my life where I struggled significantly with access to transportation to do all the things I just mentioned above, it never occurred to me that affordable transportation is also a primary human right we’ve made a privilege. 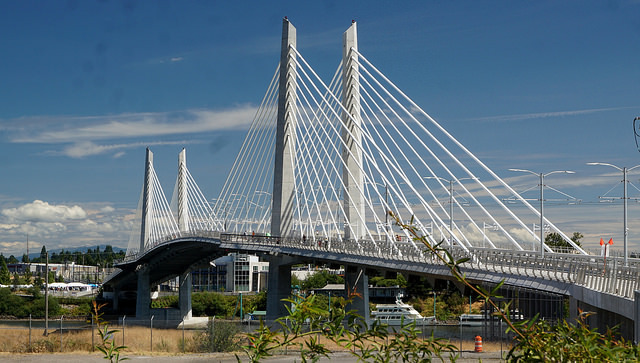 For folks with disabilities, the need for access to personal and adaptive transportation is even more stark [https://nextcity.org/daily/entry/portland-adaptive-bikeshare]. But then what does it mean to be on what is considered a relatively slower mode of transportation in a car-paced society? That, for me at least, is a more difficult question to answer. I won’t lie, commuting on a bike for some of us is a pain and a half. That pain is exponential the further away you live from where you work or get resources. If you’re like me, you can’t really do hills or inclines on your bike. I will unapologetically get off my bike and walk for part of my commute if it involves going up something. If for no other reason than to save myself a fall-down-on-the-sidewalk-gasping-fit that would inevitably come if I attempted a climb on my bike. A slow and long commute then means everything else becomes a slower longer process. 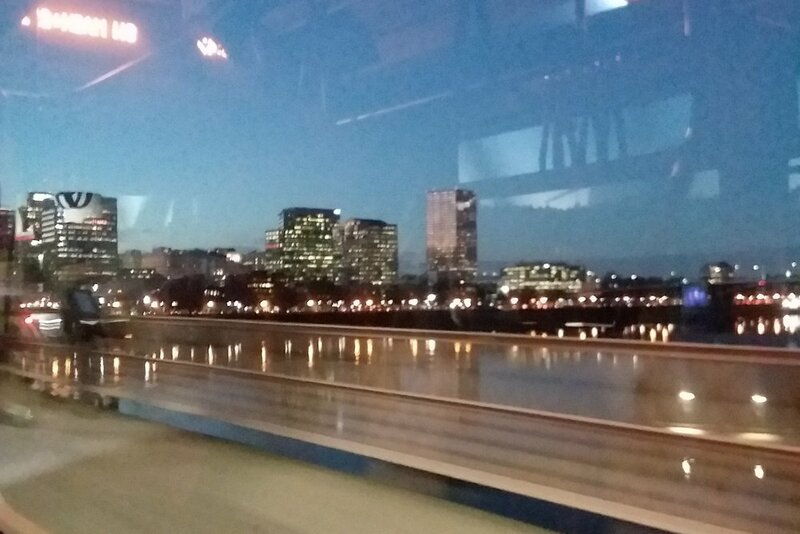 Image of downtown Portland at twilight, taken from a bus going across a bridge. Photo taken by the author of this post. I can’t be as productive as I’m used to being when I have the money for bus fare and the ability to show up earlier or stay later at work. I can’t do homework or answer calls, texts, or emails when I’m on my bike, either, so everything kind of has to wait until I get where I need to be. It’s an odd and at times very frustrating thing and it strangely supports another case for bikes over cars. You have to admit you’re human and accept your pace - even if that pace means less productivity and subsequently less money. It’s all an inescapable cycle, right? In this case, both figuratively and literally. Since my conversations with Andrew, our mission statement has become tighter and more focused. We touch on our goals of environmentalism and transportation justice, “Our mission is to substantially increase public access to affordable and safe bicycles while empowering self-sufficiency in bicycle maintenance and commute,” and in some ways it provides a few answers to the very large questions I posed at the beginning of this post. But ultimately, the role bikes play in the world at large and the role they play in our individual lives is ever evolving and our real mission, at the end of the day, is to evolve with it. 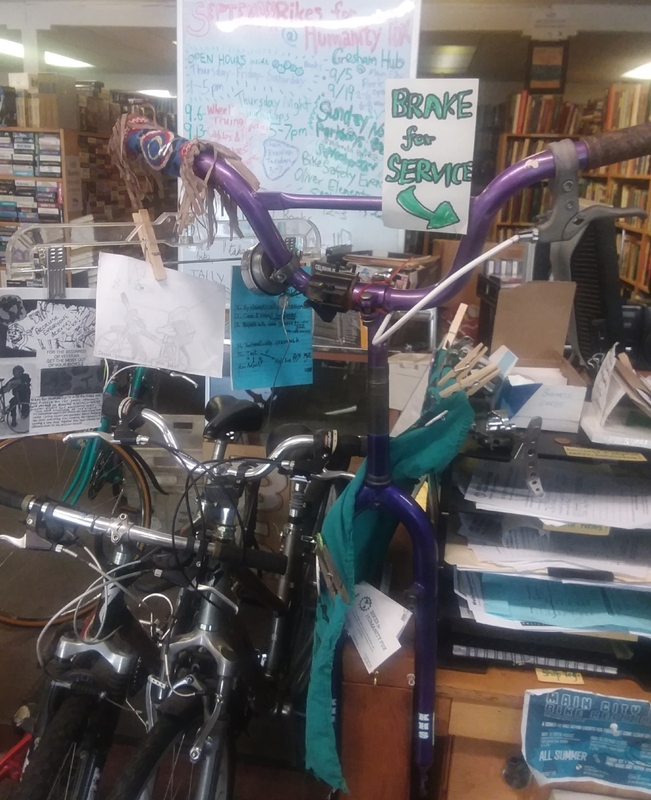 Image of a purple road-bike with rack in front of a long display and work-bench that is hosting books, t-shirts, and various bike accessories/parts/tools. Image was taken by the author of this post at our SE Powell bike shop. Additional commentary by the ghost in the machine. “Today at Bikes For Humanity it was awesome because I got to do art, clean bikes and make new friends.” - Michael C. 12-yrs-old. When Michael and his friends came in to B4H last week I asked if they would like to do artsy stuff or bike mechanic stuff (those are the technical terms, okay). Michael said artsy stuff, which is more my wheelhouse personally, so we spent a whirlwind of an hour trying to figure out if any screen-printing or other crafty stuff needed to be done. Michael ended up helping us update our white-board and wrote the above micro-blog-post. He made promises to come back when we were ready for him to show-off his screen-printing skills. Image Description: A row of t-shirts with the B4HPDX Earth-inside-gear logo printed on them. The shirts are hanging off of bike handle-bars. We have so many talented, creative, and collaborative community members like Michael here at B4H, and we’re always looking to add more! Whether you like the artsy stuff or mechanical stuff or the paperwork stuff, you’re welcome to come by. We always have things to do and the best part is having people to do it with. Image Description: Image of B4HPDX Whiteboard. Text reads: To Do For Volunteers - Profiles, Lil’Schwinn. Won’t you be my neighbor shift, Blog Posts, Udate whiteboard, clean & organize, inventory w/ Darwin or Matt, Artsy + Craftsy stuff, Bike Maintenance-y stuff, Brainstorm New Projects!, Help keep me on task w/ Darwin (seriously, help me). A Fat Bike is like the Ford F-150 of bikes. It’s the all-terrain off-roader’s dream, it’s the snow and ice cyclist’s necessity. For me - a person who has never been able to afford a car on their own, a person who’s often been one of only two sources of minimum-wage income for a household of 6, and a person who has shouldered many of the domestic responsibilities that go along with providing for family and friends while below the poverty line - it has a different and slightly less adventurous appeal. For me it’s an answer to every single time I was unable to catch a bus to work in terrible weather, either for fear of slipping on iced-over sidewalks or because the buses are running at a crawl. It’s an answer to being able to smoothly ride over the broken-up concrete and sketchy stretches of debris that run through the neighborhoods I have lived in. 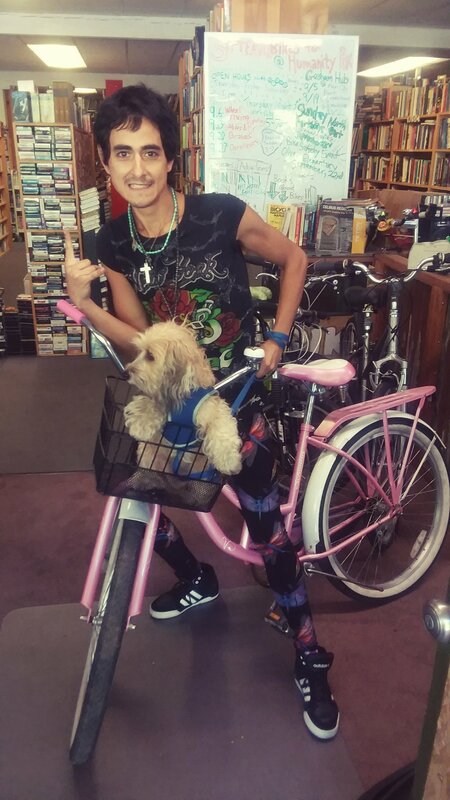 When I first saw the bike at the shop, I was giving it heart-emoji eyes like everyone else but for non-bike-enthusiast reasons. 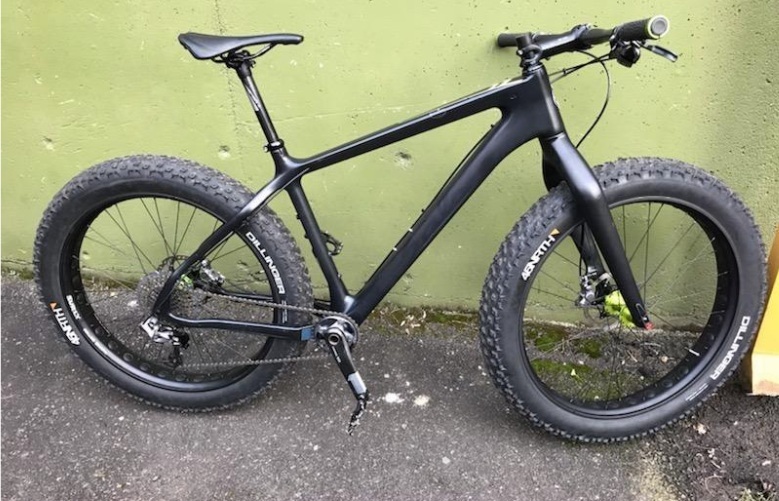 I was looking at those huge, all-terrain tires and that incredibly hardy frame and I was dreaming about hitching a bike-trailer to it and doing a massive grocery run. I was thinking about how exhausted I’ve been hauling those personal grocery carts full of a month’s worth of food back from the store on foot and/or bus. I was thinking about those days being snowed-in and unable to get basics - how if my dad wasn’t always paranoid about bare cupboards and overstocking them with cheap, shelf-stable food, there would have been times we wouldn’t have been able to go get the basics. These thoughts from someone who has lived in Oregon my whole life and never experienced a winter anywhere near the levels of someone in the Midwest or East Coast. If I’m dealing with the mild form of these struggles, I can only imagine how someone with a similar background living in less temperate conditions feels. Of course the bike is well beyond my budget, and probably the budget of many folks reading this. One might even wonder why a non-profit bike shop focused on transportation justice and accessibility, who consistently provides affordable and earned or free bikes to the community, would price something like this so high. It’s because of the next set of thoughts that ran through my head as I listened to my fellow B4H community members talk about how much these bikes usually go for - we could be set for months. Selling this one bike at this price could pay to keep the store open, our services and free programs going, and our employees employed (which will soon include me and yes that makes me biased - I’ve been both homeless and hungry before and I like both warmth and eating) for at least 2 if not 3 months. 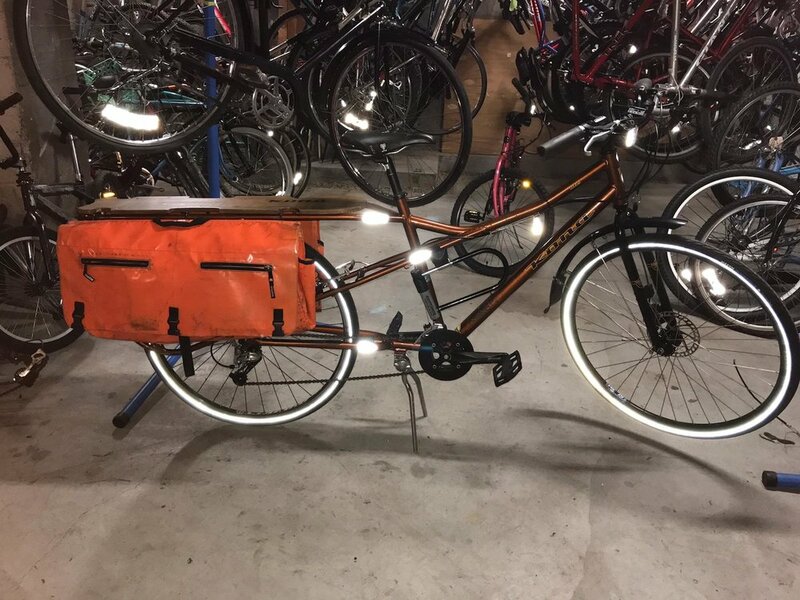 Which means that we’ll also be able to provide loads of other grocery-hauling, broken-pavement navigating, my-bus-is-late to-work-getting bikes for under 4% (I did the actual math folks) of what we’re asking for this bike. So to all adventurous off-roaders, recreational bike-enthusiasts, and community members with big hearts who can afford this bike, consider purchasing it from us. Every cent is going to go back into B4H and subsequently right back into the communities we serve. You’re buying way more than a grocery-hauler or trailblazer - you’re buying us the time and resources we need to continue to make transportation more accessible to everyone. written by Andrew, our Program Director. Click here to donate today to B4H! Bikes for Humanity isn't your typical bike shop. It isn't your typical bike school. And that's what makes it such an awesome and unique volunteer experience. On a given week in the bike season there are 6 days for individuals in our community to show up, pitch in, and expand access to bikes. Whether their desire is to learn skills, find community, or help others, volunteers contribute to all sides of the organization. They volunteer to get bikes out of the waste stream, support fossil-fuel free transportation, or earn a bike for themselves to ride. 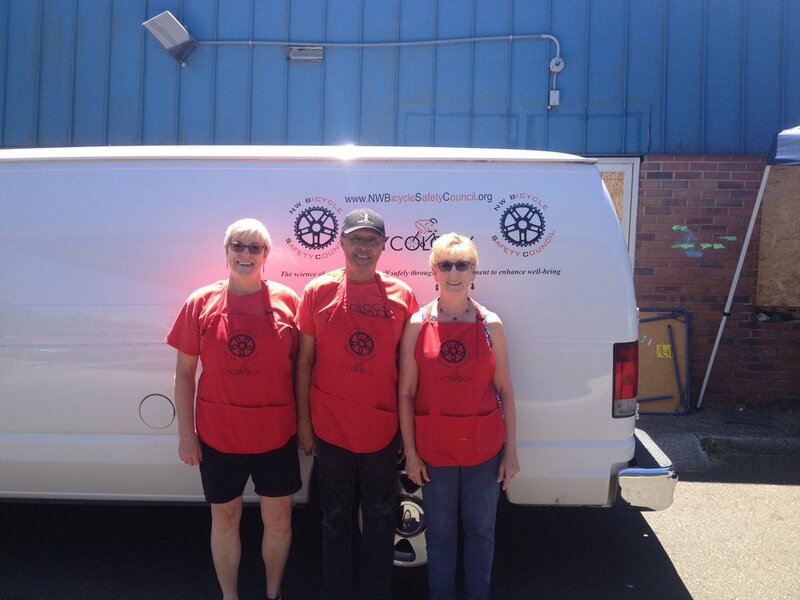 They volunteer because they love bikes, they love community, or they just love all sides of it! We get volunteers from all walks of life who come with the belief that community should include everyone. We are proud to do work that expands access to bikes regardless of economic or housing status, and we are proud that we are able to do this in a way that includes as many members of our community as possible in the process. I have been volunteering with Bikes for Humanity for over four years now, and one thing has become clear to me in that time: there are lots of strategies for getting more bikes out in the world, but the best strategy isn't the one that gets the most bikes out there. 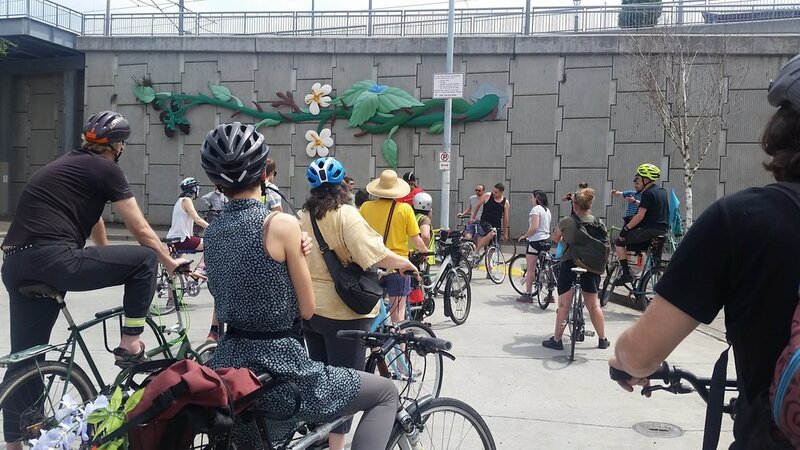 The best strategy is the one that creates meaningful and inclusive community, empowers individuals who might not look like traditional cycling advocates, and demonstrates that if we work together we can reduce our carbon footprint as we increase access to already existing materials. 1 ton of metal hauled by bike to be recycled down the street. As of this post, we have already had folks reach out with $555 of donations, nearly 10% of the way to our goal! That gives us just under two weeks to rally support for a strong fundraiser. Consider donating today, or share our campaign with friends, family, and on social media telling them why access to safe, affordable bikes, and meaningful free programs for the Portland community matter to you! Donate today and help us on our way to our goal! I am personally grateful to Bikes for Humanity for the amazing opportunity I have to devote myself full time to its mission. 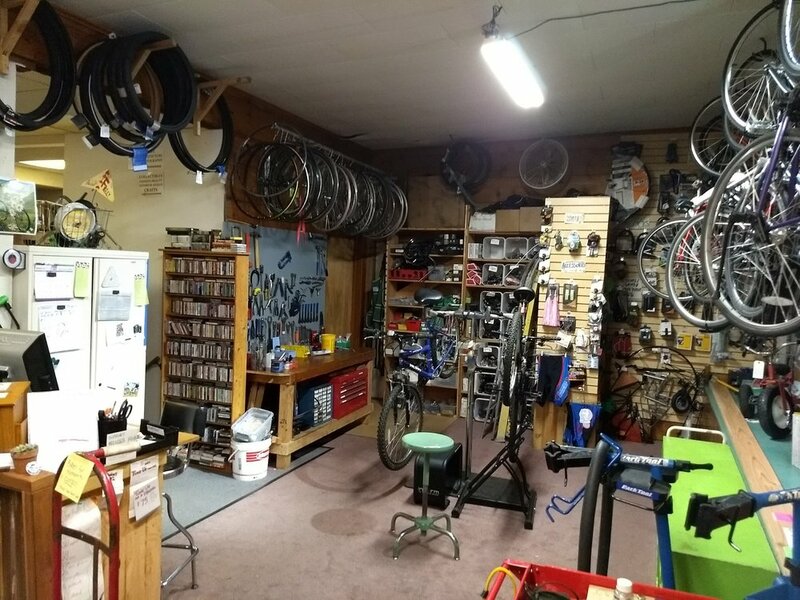 To hear stories like this one from our volunteers, to see the smiles on the faces of volunteers who realize they’ve banked enough hours to take a bike home today, or to see the sublime looks of connection-making as cyclists become mechanics. I’m especially proud that we’ve created a job for my co-worker Lori, our Thursday-Friday shop host, and have been able to employ her for almost a year. We’ve already celebrated a year since she came in to volunteer to see if she would take to some of the skills needed to run a shop, and in that time she’s got those skills and bunch more under her belt. I love that my coworker brings her plush dog Missie in every day and let’s me put her in the boss’s stool to run the space, listens to country music on cassette, and humors me by wearing a funny hat when I bring one in to prepare for a sunny event outside. Help keep our space open to everyone, and donate today! A Summer of Riding Bikes in East County! This bike season offered us the amazing opportunity to partner with the Rosewood Initiative and P:ear Bike Works on six bike events. Sponsored by the East Portland Action Plan, we were able to create bike rides and events from Lents to Rosewood, working with a tool library, two elementary schools sharing one campus, and two cities bordering one neighborhood. Along with our work this summer with the City of Gresham and schools in the Reynolds District, we have been so excited to get to know these new partners! Triumphantly arriving at the Midland Library. We started in May with a ride from Rosewood to the Midland Library where the city was hosting an open house to talk to the community about safe infrastructure in East Portland. While a small ride, the journey along the 4 Ms—Main, Millmain, Mill, and Market Streets—was a big deal for one rider, who was on a bike for the first time since he graduated from high school in the late ‘80s. Bonus: he got his bike fixed and running by P:ear Bike Works at the beginning of the ride! The P:ear Bike Works team providing love and attention to bikes in the Tool Library courtyard! The season’s first Lents International Farmer’s market! Ripe strawberries at the Malden Court Community Orchard! The magic of visiting with the Belmont Goats! Completion of an intersection painting in front of Kelly Elementary! A pollinator habitat in SE Lents! For full photo narrative, scroll to the bottom. In the meantime, enjoy this young rider escaping the bounty of the Malden Court strawberry patch. In July Oregon Walks partnered with the Rosewood Initiative to create this year’s Oregon Walkways event along 162nd Avenue: Rosewood Walkways. We came with the Northwest Bicycle Safety Council to provide a bikey corner with P:ear Bike Works for The Rosewood Walkways event. We raffled off three kids bikes, fitted free helmets for those who came by, and donated a few scoot bikes to the fleet P:ear Bike Works made available. This was the first external event for our summer intern Mary, and her first experience creating a blog post for us as well :-) At this event and Rosewood Night Out the next month, we granted and fitted over 100 helmets! September saw a partnership with Oliver and Parklane Elementary schools, as we celebrated the painting of a bike safety mural on the Oliver track with an event the Saturday morning after its completion. We provided a mini fleet of three bikes for kids to ride along the newly decorated track, which were raffled off along with a couple dozen kids bikes donated by P:ear Bike Works. Kids visited a series of stations—helmet fitting, pedestrian safety, our bike safety station—before ending at the Rosewood table to get a raffle ticket. In spite of a sudden downpour of rain, the kids remained enthusiastic, and, true Oregonians, rode soggy laps around the track. The raffle ceremony was moved to the cafeteria by some last-minute logistical magic. We had our last event this month—the Shine On! Reflective Ride—during a lucky dryspell. Participants received a free lock and usb-rechargeable lights, and got to see a lovely sunset as we wound through the curvy streets of the Parklane subdivisions and over to the dirt desire line through Lynchview Park, and back to the Rosewood Initiative. Scouting and planning this route made me appreciate the Rosewood Walkways event even more, as I realized 162nd sees only one viable crossing between Stark and Division Streets. Rosewood Walkways closed one lane of 162nd empowering the community to walk in what is usually an uninterrupted 40 mile-an-hour stretch of car-dominated space. Main serves as a safe crossing, with a light, crosswalk, and pedestrian signal. However, there exists no other infrastructure roughly a mile in either direction. For comparison, SE 7th sees nearly a dozen marked crossings for pedestrians between Division and Stark. Another interesting distinction these bikeways have from the central city is that Main, Mill, and Millmain, while listed as bikeways on the city map, have no sharrows to signal to cars, and bikes, that the street is to be shared. We encountered no challenges on our ride, and saw cars give us lots of space and time on our route, as well as some bemused looks, and also received a little cheer from folks at Parklane Park. Seeing four generations of riders, most from Portland and a few from Gresham, lighting up the streets and taking some lanes, was a great way to finish out a season of events. Written by the ghost in the machine with notes and clever lines provided by Jon and Lori. It’s appropriate that a few weeks out from Halloween, the shop would seem eerily quiet and abandoned. Any regular volunteer or frequent visitor knows that B4H is typically boisterous and busy. However, today is not a typical day. For one the shop’s still standing and relatively organized. With only a few people left in charge – Lori, a steadfast employee and Jon, a loyal volunteer – and a surprisingly calm day on Powell Blvd, it was easy to keep the chaos fairy under control. Lori says she is glad to have had time to finish up the tubes, which seem never-ending on busier days, and Jon says he is glad to have recently recruited a new volunteer. Although don’t get them wrong, as nice as it is to have a relaxing autumn day just fixing bikes and flipping over tapes in the tape player, they are in agreement that they miss the usual rush of customers and volunteers, and so do the bikes! Jon has almost finished fixing up a full-suspension mountain bike, which his freshly recruited friend dubbed “Mt. Red,” and the lovely “Fronnie,” a pastel pink late-’80s Bridgestone mixte, has been hanging overhead just waiting for the right rider to appreciate her road-warrior flare. Busy or not, at the end of the day Lori and Jon agree that they are both grateful that with the rest of the B4H crew out, the shop didn’t burn down on their watch. Darwin wrote this as an elaboration of a piece on our organization for this month's Community Vision newsletter. You can find them in our shop Thursday and Friday taking sass from Lori. Bikes for Humanity is open Thursday-Saturday, with volunteer opportunities throughout the week. I think a common experience of growing up in the U.S. is wanting to find places where we feel a sense of belonging and community. For those of us raised at least partially on 90's television, with its plethora of family sitcoms and public children's programming, that belonging was often presented in the form a friendly little neighborhood with places you could go that everyone knows and welcomes you. It's a lovely idea but often an unobtainable reality. Nowhere is ever as seen on TV. There are many things that go into this of course. Gigabytes upon gigabytes of literature exists to explain how neighborhoods and family-owned businesses are gutted by a racist, ableist, capitalist system. I think a lot of people can relate to a feeling of fear over getting invested in a home or community because it could always be gone within a matter of months. It can feel like it's just not worth the effort. Then, if we're lucky, we find spaces like Bikes for Humanity. Sure it has changed and moved around and fluctuated with its funding, but for 11 years it has plugged along steadily. B4H currently lives inside a locally owned used book store, Bingo Books, which is a delightful, friendly, and surprisingly large place (I swear it is the TARDIS of bookstores). It is also next to a small fish market whose employees are some of the bubbliest people you will ever encounter, and a local plant and farm supply store, Naomi's. Just one door over is also a charming cafe with its own B4H-inspired bike shop in the back (what can I say, when you have a good idea it catches on). Now not everything is all hearts and roses (not at all as seen on TV) but it's a wonderful cluster of friends, neighbors, bikes and books. A good place to come and find a little belonging and a taste of some 90's kid real-life nostalgia. B4H and its neighbors may not always be as they are right now (or even in the same location), but you can count on one thing - they'll always be there for you in whatever way they can. I know that makes me, and I hope it makes you, want to be there for them too." New Bike Day at HB Lee Middle School! “You guys make riding bikes fun!” one of the students at HB Lee Middle told me as we came to a stop. “Bikes ARE fun, we’re just bring them and make it safe to ride them!” I replied, but I got his point—it’s great and empowering to learn you can incorporate riding bikes into your day-to-day experience. As countless studies show, too, riding or walking to school is a great way to get your brain and body ready for a day of learning, and an amazing healthy habit to start. There are many amazing parts of this job, but easily the best part is setting up kids with their new-to-them bikes. On Saturday we were able to get six middle schoolers at HB Lee set up with bikes as part of a full commuter package, in partnership with the Street Trust, the City of Gresham, and the SUN School program that set up the mini grant event. These bikes represent the generosity of our donors, and the diligence of the volunteers who tuned and polished them up—but giving bikes to kids involves a lot more than just dropping off bikes and leaving. This wouldn’t have happened without the educational experience provided by SUN Schools and the Street Trust, and the City of Gresham for making it all happen, including new helmets for all the students involved. Bikes for Humanity staff and volunteers supported the Street Trust during 4 days of bike safety education (BSE) this August in the Reynolds District. The Street Trust brought their fleet to Reynolds and HB Lee and led four groups through a morning of their BSE curriculum. Starting with getting everybody comfortable on a bike (or even learning to ride that day! ), and ending with a community ride to the park and back, these kids gained a basic mastery of navigating safely through their neighborhood. We were super excited to connect with Caty from the SUN school program who hosted us at the school, and get the most enthusiastic participants on bikes when school started again—and more excited to see them all again! Thanks to all our partners for providing the education, community, helmets, and locks so we could show up with bikes and bells and set up these young commuters! 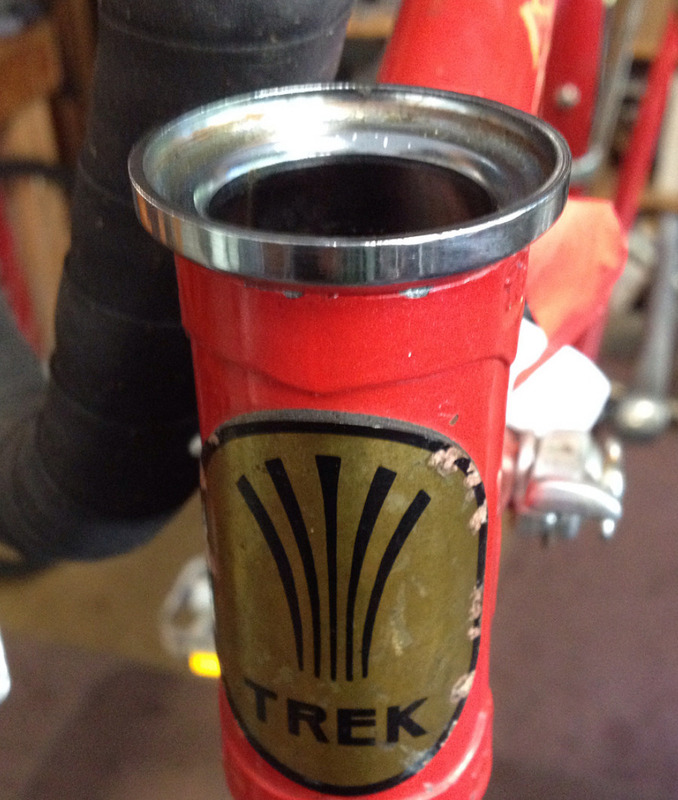 At the shop today, I was handed a classic mid-80s Trek road bike that needed an overhaul. It was a very nice old bike, with all original components. But it had seen better days. The original wheels with their Matrix rims would have to be cut up and rebuilt, a project for another time; we swapped in another set of used wheels that would work just fine. Then, I looked at the headset. The cups were both loose enough that I could remove them with my fingers. Not good. I pulled everything apart, cleaned all the pieces and determined that, if properly re-installed with fresh grease it would be just fine. So I went to work on fixing the loose cups. 1. 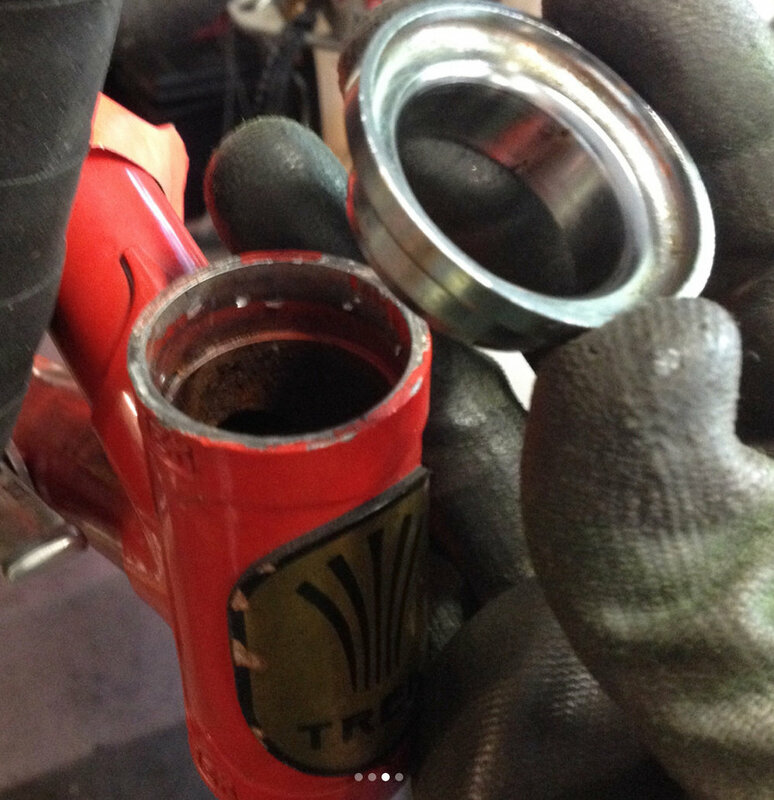 Remove the cups from the head tube and clean out everything inside the head tube. Examine the inside of the head tube carefully to make sure nothing is cracked, sticking out or otherwise impeding the turning of the fork's steer tube. Note how smooth the top of the inside looks. There's really nothing there for the cup to gain any purchase on. When the bike was new, this wasn't a problem, as the parts had close tolerances and fit together tightly; but many miles of riding have loosened things a bit, and sometimes the cups will get wobbly. Ignoring this situation until it's really annoying will cause damage to the frame and fork. Don't wait! You COULD fix this with a strong two-part epoxy, and I'll admit that I've done it that way once or twice in my early days of wrenching. But epoxy has two strikes against it: it's messy and hard to clean up, both during and after application; and it has nasty chemicals in it that are not good for you or the for the earth. So skip the epoxy and just use tools. 2. Take a chisel and a hammer. Working your way around the inside of the head tube of the frame, carefully aim the corner of the chisel's edge into the metal of the inside wall, and tap with the hammer. Be careful not to hammer too hard or you can risk damaging the headtube's edge. Take your time; a couple of lighter taps each time should do it. What you want to do is deliberately gouge out tiny metal "teeth" into the head tube, thereby making the inside diameter of the head tube a tiny bit smaller so the tolerance between it and the headset cup will be tight again. You don't need to go crazy with this; every 1/4" or so of tiny gouges all the way around should be sufficient. If you're at home, but you can still put your frame in a bike stand, there's another way to do this: Get a section of 2 x 4 (at least a foot long). Wrap it in a shop towel, position the cup on top of the head tube and position the wrapped 2 x 4 on top of the cup, making sure all edges of the cup are in contact with the wood. Take a hammer and carefully pound on the wood until the cup settles into the frame. Check your work periodically to make sure the cup isn't being ovalized, or going in so crookedly you'll need to punch it out and start again. If you've done everything right, it should look something like this. You'll note that I installed one cup at a time, because the nonprofit where I'm working this summer doesn't have a headset press. I repeated this process for the bottom cup. Then I added clean bearings and fresh grease, installed the fork and voila! Good as new. 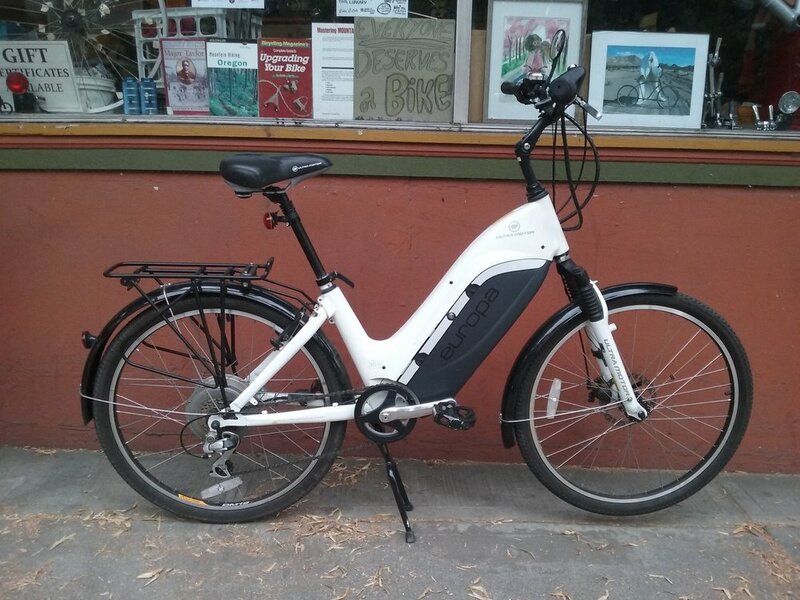 This electric assist bike was donated to us several months ago in fairly pristine condition, and just needed a few adjustments and a charge to the battery. There's always a lot going on in the summer at b4h, so researching and promoting the bike has fallen by the wayside. When Darwin approached us about renting it to be able to make it to a job site beyond the realm of public transport, we agreed they could borrow it in exchange for a blog post about the experience that we could use to promote the adoption of this lovely and utilitarian machine. Near the beginning of 2018 I was given a promotion at work. The position I was promoted to had previously only been given to people with a car and there was some concern from my boss and colleagues that my inability to drive would cause issues with my job performance. The fact that they gave me the promotion despite these concerns speaks to my overall awesomeness, of course, and anxiety gradually eased as I continued to prove myself reliable using public transit and the occasional Lyft ride. Then I was tasked with venturing out to a worksite 10 miles beyond the purview of Trimet. Additionally, Lyft and other cab services would take me out to that site but they would not send a driver out to take me back. The people I knew with cars had work the days I was meant to be out at the site and couldn’t come pick me up. I was nearly sick with anxiety trying to find a solution. I didn’t want my lack of transportation to keep me from doing my job and override all the other things I bring to the table in my work. I remembered that Bikes for Humanity had an electric bike they were getting ready to sell. I didn’t have the money to buy it but I hoped they would let me rent it for the days I was meant to be out at that particular site. Of course Andrew, the B4H director, did me one better and let me borrow it for free. He’s too precious for this cold capitalist world. Would the bike be able to fit on the bike rack of the bus? Would I be able to lift a huge gajillion ton bike on of the bus after my body was a noodly mess from work and riding back into town? Would the Lyft/cab driver taking me out there from town (but not taking me back because…?) be willing to take the bike with me? Then the only fears that were left were these - would the battery hold for as long as I needed it to and how the hell was I going to survive speeding down a winding twisting NW Skyline/Cornelius Pass road? Well I obviously survived and despite shaking from adrenaline and taking downhill curves at 40 miles an hour, I actually ended up enjoying the ride a lot. The ability to work a third as hard going uphill thanks to the motor assist was a blessing during a 10 mile ride in 99 degree weather. So was the luxury of just being able to cruise without pedaling on long flat stretches of rural farmland. Total between the the two trips I rode it for, the battery lasted 2.5 hours and 19 miles on one charge. I was able to reassure my boss and colleagues (and myself tbh) that a lack of car was not a barrier to doing my job. Bikes for Humanity helped me prove that reliable transportation can come in many forms and their electric bike helped me save my job and my life. I’m not exaggerating, if I had had to walk or just use a regular bike for those 10 miles I literally would have died...at least partially...mostly on the inside. Anyway, electric bikes are great, B4H is great. Save the planet and your job and get this bike! Bikes for Humanity at Rosewood Walkways! Last week was my first as an intern at Bikes for Humanity, a nonprofit aimed to increase bike access and education to the community. I worked two days at their shop on Powell in SE Portland before heading out to East Portland that Saturday for my first event as part of the team--Rosewood Walkways. The mission of the event was to create a comfortable pedestrian environment in a neighborhood with 5-lane busy streets passing through it, and to connect that community through a day of celebrating activities they made walkable. To make this event happen, the Rosewood Initiative and Oregon Walks partnered up. 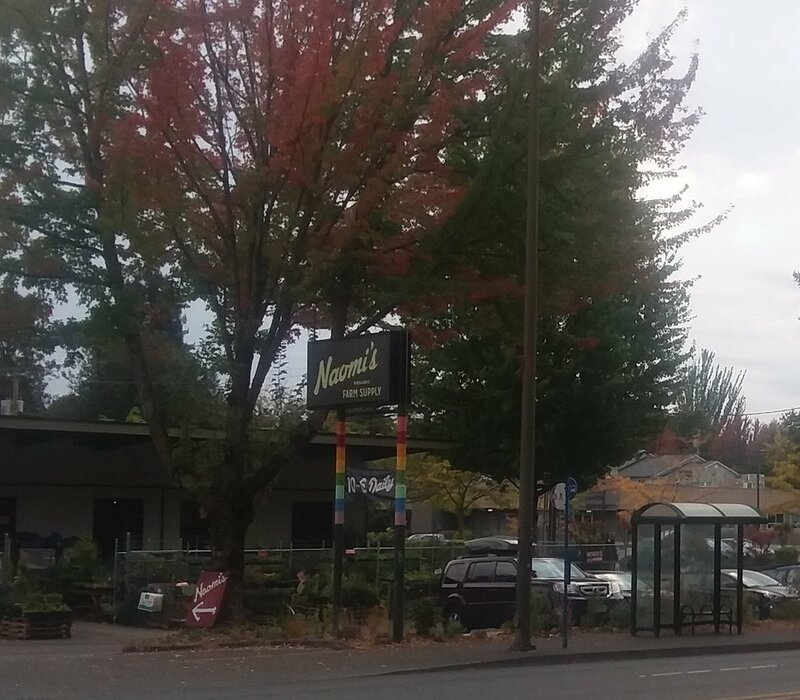 The Rosewood Initiative wants to make Rosewood a safer and happier place to be, and Oregon Walks works to create better walking conditions for Portlanders. So together, the Rosewood Walkways event was born. Part of SE 162nd, a busy street next to the Rosewood Initiative, was closed off for the event, along with part of Main St. to create a pedestrian walkway to Parklane Park. Numerous tables were lined up along Stark, and more were stationed at Parklane. The organizations that came to table at Rosewood Walkways were a particularly important part of the event, for making it both fun and educational. Bikes for Humanity was one of these organizations, and we set up our booth near the Rosewood Initiative building. P:ear Bike Works just opened up a shop in the back of the Rosewood Initiative, and their entrance on the alley south of the building was open. They also had scoot bikes available for kids to use for the event, lined up outside on the side we were tabling on. With their set up, our table and the NW Bicycle Safety Council’s helmet-fitting station, we created a bike corridor, ideal for educating anyone who came by about bicycle safety and access to bikes. Bikes for Humanity had a special event planned at our table too. We had three kids bikes, restored by our mechanics, to be raffled off to Rosewood Walkways participants entirely for free. It was a way to give to the community and inspire youth to get into cycling. All three bikes, two of which I named Arizona and Bumblebee, and a third Andrew named Major, went to a group of local Rosewood siblings. We were able to give them and other riders free helmets too, thanks to the donations of the NW Bicycle Safety Council. Seeing those three kids ride off together after winning was the highlight of my day and put a big smile on my face. It’s just the beginning of my time at Bikes for Humanity, and I know I still have a lot to learn. But I’m looking forward to more experiences like Rosewood Walkways. Too many folks are nervous about riding because they don't want to do it "wrong." The truth is, there are a million awesome ways to ride your bike. Here's a very non-comprehensive list.